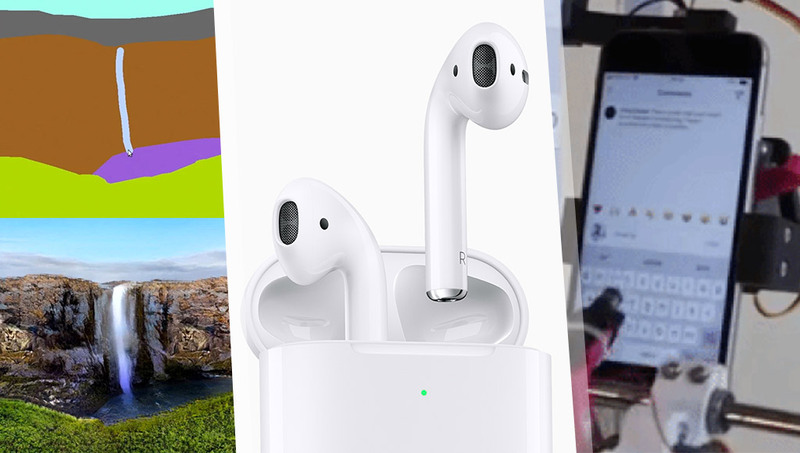 This week we had machine learning grant us the ability to turn crude sketches into photorealism, fancy new AirPods with a new H1 chip, a robot that hangs out on social media, Palmer Luckey isn’t happy with the Oculus Rift S, and lots more. Palmer Luckey, the founder of Oculus isn’t happy with the interpupillary distance set up (the distance between each eye) of the Rift S.
Tony has a nice look at the new headset announced too. That’s a nice sign that VR is still finding its way. The Focus’ focus is on businesses — it’ll be out April 15th. It’ll be coming to PSVR and SteamVR bringing a first person view of the game. It’s an official game where you’ll fight Marvel villains — but you’ll need a PSVR for it so far. You can see what it’s like to see the world as this tiny nocturnal animal. ZeroPhobia, a Google Cardboard mobile VR app, aims to help those with a fear of heights and found some success in a recent study. This VR experience aims to raise awareness of suicide “while presenting it in a new light”. It’ll be on HTC Vive and Oculus Rift. A look at the state of brain-computer interfaces the near future where VR/AR headsets have with EEG devices. “Eye-tracking specialist Tobii announced the launch of its XR Software Development Kit (SDK) this week at the Game Developers Conference 2019”. Nintendo released a 7-minute trailer showing the range of games coming for their VR Kit — the kit will be out on 12th April! A dev kit that adds lip-tracking capabilities to the HTC Vive Pro & Vive Pro Eye that is detachable from the headset is on its way. HP announced Reverb, the successor to their first Windows VR headset launching late April. It turns out, the ODG assets were bought sneakily by Magic Leap. I need a Magic Leap. Quick. Send me one to the far away land of Australia! Indie augmented reality developers and startups — definitely check this out. Unity has announced that its AR Foundation update for the Unity Editor tool will enable AR games to run easily on both Android and iOS devices. The new “Apple Card”, Adario Strange believes, is another step to extending Apple Pay to more people ready for when it works via smartglasses. TeamViewer, known for their remote access software, are moving into AR remote assistance. Krikey is currently available on both the App Store and Google Play for free. The “Shazam!” Lens is the first to use the speech-activated feature that Snapchat introduced in August 2018. Say “Okay Shazam!” and you become Shazam! “Key players in AR, MR and even XR talk about the near future, and explain what could go wrong”. Apple’s wireless earbuds were just updated with a new H1 chip and optional wireless charging case! Just in time too… it turns out the batteries in devices people bought a few years ago aren’t fairing so well. Android owners who can’t enjoy the Apple Watch are turning elsewhere boosting those device sales. Gizmodo liked a lot about Samsung’s smartwatch, but health tracking isn’t up to scratch. The Inspire and Inspire HR will be replacing five Fitbit devices: the Alta, Alta HR, Zip, One and Flex 2. This new $99 single-board computer is for amateur programmers interested in building basic AI. I like its name! This machine learning powered software lets you sketch images that become nearly photorealistic! “MIT’s algorithm can design machine learning models up to 200 times faster than traditional models”. In one drive-through trial in Miami, “algorithms crunch data as diverse as the weather, time of day, local traffic, nearby events, and of course historical sales data, both at that specific franchise and around the world”. Google researchers get their AI to play Pong in a newly published paper. “Estonia plans to use an AI program to decide some small-claims cases, part of a push to make government services smarter”. Not like any robots I’ve ever seen — these loosely connected disc-shaped bots push and pull one another together to transport objects. “We question how AI could label an image of a dog as a pineapple. But research shows there’s a logic to these errors that humans can intuitively understand”. Sure, those other disc robots could move things around but this robot can navigate social media. And this one climbs walls. VentureBeat says Google’s new gaming platform called “Stadia” is all about the cloud and AI. Here’s how one maker used some off-the-shelf parts and a bit of code to open his door with Wi-Fi. All About Circuits looks into this commonly used piece of tech! How to build a mesh-networked pack of remote controlled cars with Particle microcontrollers!